For more than 80 years Luigi, his family and Massimilano have given their contribute to preserve and promote one of the most ancient and prestigious brand of amaretti from Mombaruzzo. Today they keep on maintaining their old and solid tradition with a complete handcrafted and genuine production and with a selection of the best raw materials. From their experience comes Antica Amaretteria an artisan workshop specialized in the production of high quality amaretti. Code: AMA1T – 150gr soft classic amaretti, cartons of 15 packets. Code: AMA2T – 150gr soft candied orange amaretti, cartons of 15 packets. 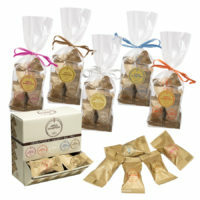 Code: AMA3T – 150gr soft chocolate amaretti, cartons of 15 packets. Code: AMA4T – 150gr soft black cherry amaretti, cartons of 15 packets. Code: AMA5T – 150gr soft hazelnuts amaretti, cartons of 15 packets. Code: TUBOMIX – 150gr soft amaretti, mixed cartons of 15 packets. Code: AMA1S – 200gr soft classic amaretti, cartons of 15 packets. Code: AMA1 – soft loose classic amaretti, cartons of 3 kg. Code: AMA2S – 200gr soft candied orange amaretti, cartons of 15 packets. Code: AMA2 – soft loose candied orange amaretti, cartons of 3 kg. Code: AMA3S – 200gr soft chocolate amaretti, cartons of 15 packets. Code: AMA3 – soft loose chocolate amaretti, cartons of 3 kg. Code: AMA4S – 200gr soft black cherry amaretti, cartons of 15 packets. Code: AMA4 – soft loose black cherry amaretti, cartons of 3 kg. Code: AMA5S – 200gr soft hazelnuts amaretti, cartons of 15 packets. Code: AMA5 – soft loose hazelnuts amaretti, cartons of 3 kg. 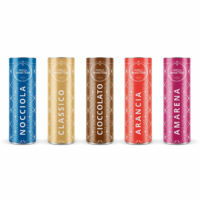 Code: ESPAMA – soft amaretti in display, cartons of 3 kg. Code: AMAMIX – 200gr soft amaretti, mixed cartons of 15 packets.